Ninja Attack! introduces dozens of unforgettable real-life ninja straight out of the annals of Japanese history--many of whom are all but unknown outside their home country. Ninja masters. Solo assassins and operatives. Femme fatales as deadly as they were beautiful. Swordfighters out of legend. And the Shogun and warlords who commanded them. Each individual in this graphic novel is profiled with a full-page manga-style drawing and a dossier brimming with top-secret information, including photos, anecdotes, and dramatic stories of the individuals in action. The book covers ninja clothing styles, the types of weapons that were used, ninja tools, ninja tricks of the trade, and the basics of the ninja diet. It also includes a do-it-yourself tour of ninja related spots in modern Tokyo. Ninja Attack! is everything you always wanted to know about ninja but were too afraid you'd get a shuriken in the eye to ask. 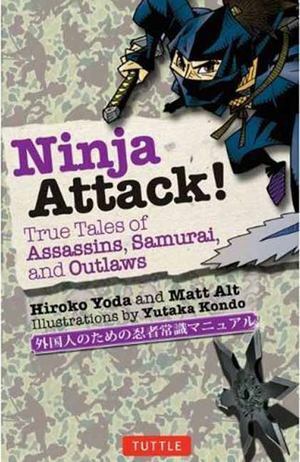 Legendary ninja covered in this book include: Prince Shotoku Mochizuki Chiyojo Hattori Hanzo Matsuo Basho Mamiya Rinzo Jiraiya Together withYokai Attack! andYurei Attack!, Ninja Attack! is the last guidebook to Japan you'll ever need.